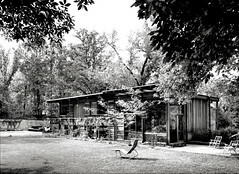 The home Harris Armstrong designed for his family in 1951. It is essentially a rectangular volume clad with wood and perforated by glass. The large clear glazing toward the right corresponds to the double-height Living Room. Photograph courtesy of the Harris Armstrong Archives, Special Collections, Washington University in Saint Louis, Missouri.